But how big a dose makes a difference? Thirty minutes of exposure to nature every week helps reduce depression and blood pressure. How much to you get? It’s widely acknowledged that a ‘dose of nature’ is good for us but how much is enough to generate positive outcomes? We recently analysed people’s health outcomes resulting from an exposure to green spaces and nature and found it didn’t take much to create enduring benefits. We found that people who manage to get a 30 minute (or more) ‘dose of nature’ each week are less likely to have high blood pressure or depression (Shanahan et al, 2016). The public health and financial implications of this are immense. Depression alone costs Australia $12.6 billion per annum as well as being a huge impact on the quality of life, and around a third of Australian adults are affected by high blood pressure. Our analysis shows that the prevalence of depression could be reduced by up to 7% and that of high blood pressure reduced by 9% if everyone met this 30-minute minimum-dose guideline. The potential savings to public health budgets associated with this simple behavior change are likely to be substantial. The average ‘duration’ of those experiences. We modelled these relationships using survey data from over 1500 residents in Brisbane, Australia, taking into account all the other variables that influence a person’s health and wellbeing, such as gender, age and income. Figure 1: The dose-response graphs here show the likelihood (or ‘odds ratio’) an individual has A) depression, or B) high blood pressure given incrementally increasing the average duration of a vist to a green space (95% confidence intervals are shown). An odds ratio above one indicates an individual is more likely to have the illness where the threshold of green space visitation is not met. Importantly our study first showed that nature delivered multiple health and wellbeing benefits across the population all at once, thus highlighting the uniqueness and importance of green spaces as a health resource. Our research also showed how behavioural interventions might be altered to deliver health outcomes of particular interest to different communities. For example, we showed that people who made long visits to green spaces had lower rates of depression and high blood pressure, and those who visited more frequently had greater social cohesion (Figure 1). Higher levels of physical activity were linked to both duration and frequency of green space visits. Social cohesion and physical activity themselves are itself important for public health, as they have positive associations with physical and mental wellbeing. These flow-on benefits are likely to add considerably to the economic and social value of urban green space. There was no indication in our study that the complexity of vegetation had a significant effect on the health outcome measures in this study. This is despite the fact that previous research has shown that more biologically diverse areas can provide greater restoration benefits (Fuller et al, 2007), or that more densely vegetated landscapes are often less preferred. However, we suspect our results point to the challenges in measuring the nature experienced by individuals at the population level, and suggest that further experimental work in this area is warranted. Diverse benefits The benefits we get from spending time in nature are spectacularly diverse. In our study alone we showed benefits for mental health (depression), physical health (high blood pressure), social health (social cohesion), and a positive health behavior (physical activity). Given this, the cumulative cost savings across all health outcomes could be immense if this behavioral change was targeted. Together this work shows that urban nature is an incredibly promising tool for enhancing the physical, psychological, and social well-being of the world’s growing urban population. A surprising number of Brisbane residents in our study failed to meet even the 30-minutes-a-week recommendation for nature exposure. In fact, around 40% of residents spent no time at all in green spaces during our survey week. In one of the studies in this project we explored whether it’s the opportunity to experience green space (that is, its availability), or orientation towards nature (measured as nature relatedness) that is the more important predictor of actual use. We found that while availability was of course important, nature relatedness was a much more important predictor (Figure 2). 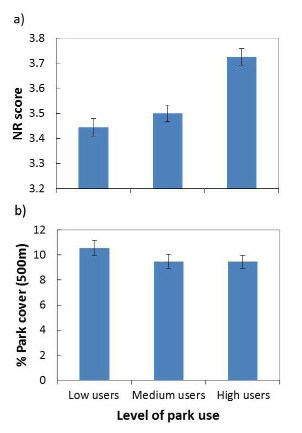 Figure 2: Comparisons of low, medium, and high park users (based on time spent in parks) according to a) participants’ nature relatedness (NR) score, b) coverage by parks at a 250 m, 500 m, and 1 km radius around the home. Does nature help us get active? 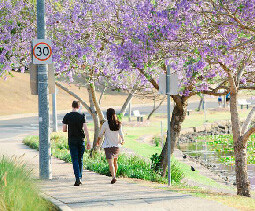 Brisbane residents who get plenty of physical exercise tend to visit green spaces more frequently and for a longer duration (Shanahan et al, 2016), yet it remains unclear whether having green spaces close by actually encourages people to exercise that otherwise would not. Intriguingly, it appears that the benefits of exercising in natural surroundings are greater than the same amount of exercise indoors a non-natural setting such as a gym, conferring a synergistic effect on health benefits. 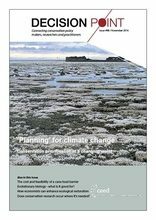 There are several potential reasons for this – air quality is often better in natural areas, experiences of nature can reduce blood pressure or stress, and the psychological restorativeness of nature might in some way interact with exercise to produce a greater overall benefit than either in isolation. Thus, encouraging physical activity in natural, green spaces may be able to increase the health and wellbeing benefits more than what might be expected in current estimates. Wherever we look, we seem to find benefits of experiencing nature! Shanahan DF, L Franco, BB Lin, KJ Gaston & RA Fuller (2016). The benefits of natural environments for physical activity. Sports Medicine 46: 989-995.